Plot Summary: After witnessing a murder by the evil organization "Destron," Shiro Kazami becomes their next target. Shiro goes home to find his parents and sister murdered by Destron before Kamen Rider 1 and 2 save him from the same fate. He asks them to convert him into a cyborg, but they decline, reminding him of the pain of losing their humanity. During a battle against the Destron leader, Shiro thwarts the organization's plot to destroy the Riders - at the expense of his life. 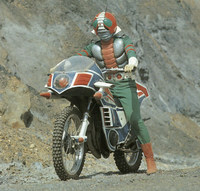 The Riders then have no choice but to turn him into a cyborg. Shortly afterwards, Shiro becomes Kamen Rider V3 to protect mankind against Destron. DVD Encoding: JN Productions, Inc. Licensed by: JN Productions, Inc.